Mazda's typical buyer is not one obsessed with horsepower or cornering G's. The company's bread and butter comes from economical consumers, and to most, Mazda stands for simple, efficient commuters. It may come as some surprise then, to hear that more Mazdas are road-raced on any given weekend than any other manufacturer. Here are the three main reasons why Mazda has such a strong presence in the world of motorsports. Part of what makes Mazda unique is the number of sporty cars the marque has provided throughout its history, and cars like the Mazdaspeed Miata are still competitive, maybe even better, than a new versions. It's a company which survives on economical cars for ordinary drivers, and yet Mazda seems to have a commitment to maintaining a lineup with at least a few sporty models. The RX-7, RX-8, and of course the Mazda Miata are the most obvious examples, but you will still drivers competing in humble Mazda 2's. The Protege, Mazda 3, and Mazda 6 all have Mazdaspeed variants, all with loyal followings. Road racing is an expensive hobby. Spares, tires, transportation, entry fees, hotel, etc. Mazda takes some of the pain out of the process. Miatas are plentiful, have tons of aftermarket support, cheap parts, and the Miata community is incredible strong and supportive in Motorsports. Again, the Miata does not stand alone, the story is much the same for the other models which are found in plentiful numbers in all kinds of racing. These cars also make a great platform for racing--Mazda is often underestimated in handling, and the RX-7s and -8s are RWD, as is the Miata. Don't discount the FWD cars though, they are quite competitive. Mazda, more than any other manufacturer in the consumer segment, provides and incredible level of support to amateur racers. For example, Mazda has a number of contingency programs, in which rewards are given to a variety of racers for representing Mazda Motorsports. 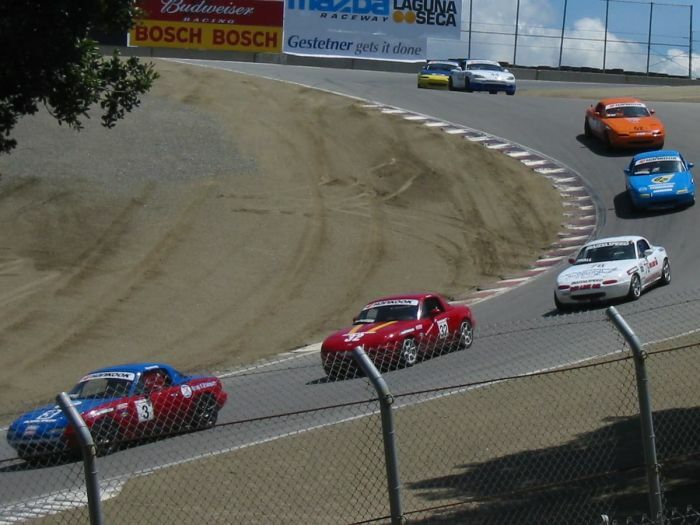 Among them is an opportunity to win $30,000 in the Spec Miata series. I know what you're thinking: these awards must be for factory racers, right? Nope. All you have to do is participate in the contingency program. They even give awards to autocross drivers, which anyone with a Mazda can participate in. For more details, check out their contingency Website. Mazda's motorsports presence isn't going anywhere. They have a handful of strong professional teams, and seem to be committed to maintaining the sportier part of their brand, as shown by the even more powerful 2019 Mazda Miata. In addition, they offer inexpensive options for the new buyer, and the used market is far from starved for choice. Parts are cheap, and you can even have some of the expenses eased by contingency programs. What are you going to do to actualize your racing ambitions? Sure, you can do it with your Mazda if you quit your job and pay to drive across the country with your car on a trailer, and you are a BA driver and have money to pay a crew, and tires, and fuel. There is more Mazdas racing than any other brand actually. My buddy was sponsored through Mazda motorsport and I still have the sticker on the race car. You can get paid to win. Contingency programs are not a new thing, lots of manufacturers do them. To tell the truth, I am not aware of any manufacturer that supports Club racing like Mazda does. Their ladder system is pretty incredible but so are their contingencies and new parts pricing. Yes, Mazda's Contingency rocks. The one season we decided to really make a run at Solo Nationals in STU we actually made enough in contingency through the season to pay for our trip. I am definitely not making any Contingency money yet but I still have the decals a) because racecar and b) in case everyone else breaks down and I win. I made a few bucks last year at Mazda racing. I Think it was like $68 for 4th place at a Prosolo. paid for gas and some food. Mazda has a great support program and there are more Mazda’s raced every weekend than any other manufacturer. I’ve completed in Spec Miata on an SCCA Majors level and on a pro level. It’s a great platform and the Mazda executives fully support motorsports. I highly recommend it and it’s really competitive. We have sponsors in our time attack series. You can win valuable prizes that defray your operating costs. Wouldn't call it getting paid though. Yep. I have cashed in a couple thousands of dollars over the years on Mazda contingency. The discount parts deal is the real win. Usually, better prices than even the dealer can get. I used the racers discount to get pistons, bearings etc. for my engine build for my autocross car. The Horror - Are Half Of Mazda Miatas Sold Automatics?! Mazda Teases New Crossover Model - Will It Be Larger Than CX-5? What Do the New BMW 8 Series, BMW Z4 and Jeep Gladiator All Have In Common With the Mazda Miata?